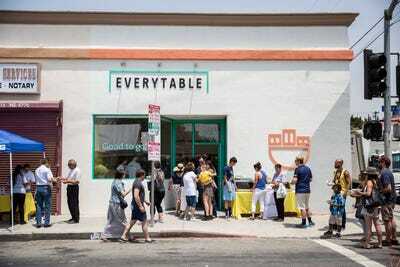 Everytable/FacebookEverytable, a healthy fast food joint in Los Angeles that rivals McDonald’s prices. Founded in 2013, Salad and Go is a drive-thru chain that sells 48-ounce salads for $US5.74. Its soups, smoothies, and breakfast all cost about $US4. 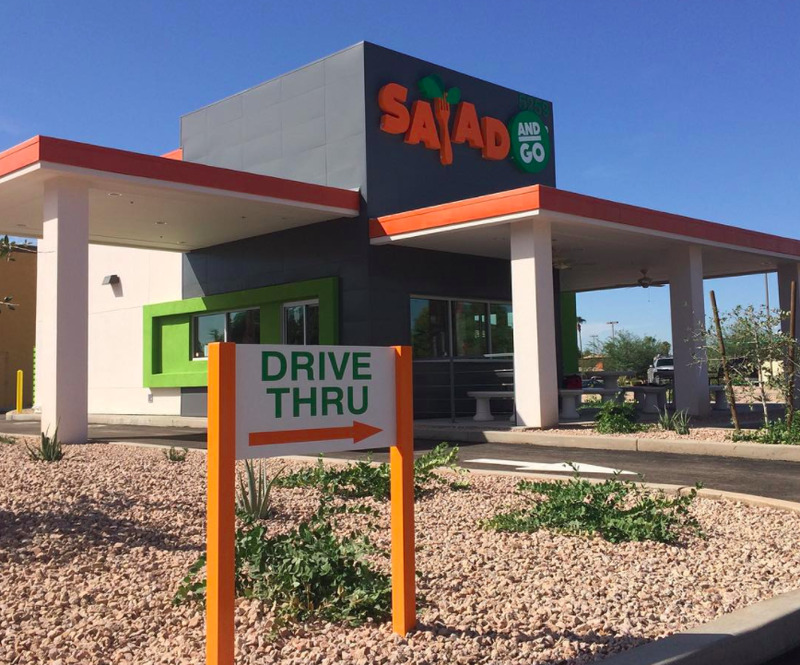 The chain has grown to encompass 10 locations in Arizona and plans to launch nine more in Arizona and another state by the end of next year. In a recent survey by Deloitte, over 75% of respondents reported they had healthy eating habits, and 83% said the typical fast-food menu didn’t offer enough healthy choices. A 2014 survey by the research company Technomic found that 73% of people between the ages of 22 and 37 said they are more likely to buy “local” food. In the past decade, healthy grab-and-go chains like Sweetgreen, Dig Inn, and By Chloe have launched to appeal to those consumer preferences. Such purveyors specialize in locally sourced, often organic food that has fewer calories than most traditional fast food items and features more vegetables. But on average, their dishes still cost twice as much as those sold at places like McDonald’s and KFC. Newer chains, however, are figuring out ways to drop prices even lower. California chain LocoL, from famed chefs Roy Choi and Daniel Patterson, serves meals with locally sourced ingredients for $US6 or less. And entrepreneur Kimbal Musk also recently opened a grab-and-go restaurant called The Kitchenette where everything costs under $US5. There’s only one location right now, in Memphis, Tennessee, but Musk previously told Business Insider that he hopes to open more. 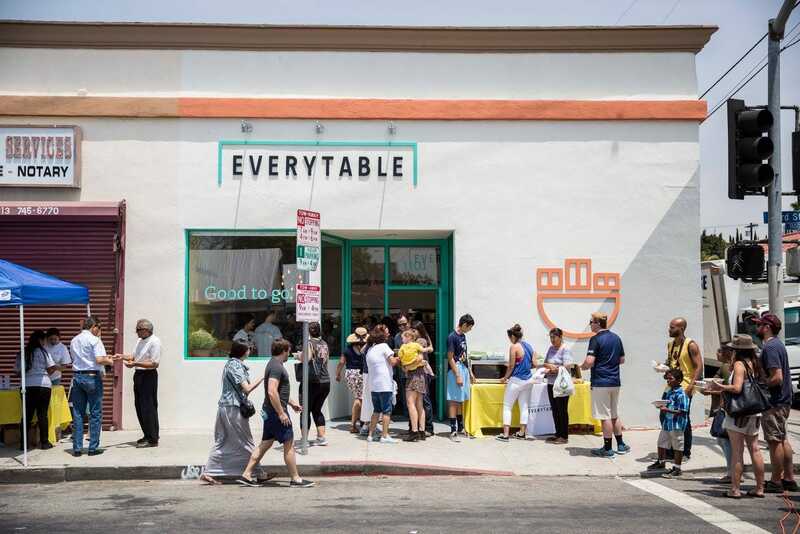 A fast food joint in Los Angeles called Everytable has an especially innovative pricing scheme: its prices change based on the average income in the neighbourhood where a store is located. In the South LA location (where households earn a median salary of $US30,882), salads and bowls cost less than $US4.50. Everytable’s second location in downtown LA (where the median salary is $US99,990) offers the same items for around $US8. Both stores’ ingredients are sourced from the same local purveyors, but sales in wealthier neighbourhoods partially subsidise operations in lower-income areas. Salad and Go has several strategies to keep its operational costs low, which helps decrease menu prices. Its locations measure just 650 square feet and don’t have indoor seating, which cuts down on energy costs. The company also doesn’t need to work with a middle man to buy the ingredients, since it works directly with local or regional farms. “Usually, fast-food restaurants want these profit margins at 20% or higher, and this causes them to pass on expenses to their guests. Our goal is that for any efficiencies gained, we’re pouring right back into our company. Kind of like Amazon, we’re not looking for a short-term profit,” Christofellis said. 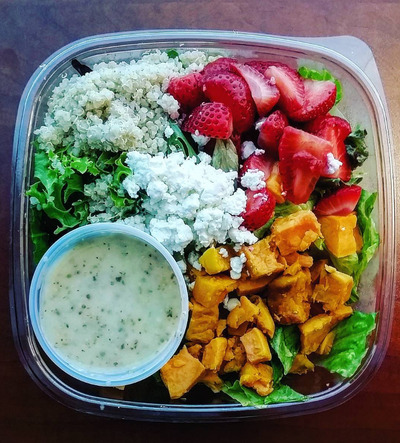 Instagram/mindbodymargaritasA salad from Salad and Go. Traditional food companies are, of course, taking notice of this shift. In late 2016, top executives from PepsiCo and Campbell Soup Company told Fortune that cleaner food is not just a trend, but a movement. Legacy fast-food chains are making changes to keep up — in the last four years, Taco Bell has pledged to cut artificial ingredients and use cage-free eggs, and has introduced a lower-calorie menu. McDonald’s has worked with dietitians, started sourcing antibiotic-free chicken, and added more salads to its menu. But the growth of healthier fast-food competitors still depends on new chains’ ability to drive down their expenses. Salad and Go thinks it can do that. “We’re trying to do something huge, and that’s going to take sacrifice and not thinking like a traditional restaurant,” Christofellis said.